Destiny Nation: Korea is familiarity, stories, and information. I spent 4½ years teaching English in South Korea and through it all I shared my experiences on my website and YouTube channel by the same name, the Red Dragon Diaries. During my time in Korea I received literally countless comments and questions about the experience of teaching and living abroad. I’ve written over 300 blog posts and created just as many videos that were indicative of my life in the Republic of Korea. This included daily life, teaching tips, martial arts training, food, and travel. However, most people cannot wade through everything to find the answers they are seeking. As it became an increasing challenge to answer everyone’s questions, I decided to put my knowledge and experience into this book. It’s part self-reflection, part job hunting resource, and part mental preparation for those wishing to teach English in South Korea, and even the curious window shopper considering the endeavor. Are you qualified to teach abroad? Destiny Nation: Korea is available in most major ebook formats including ePUB and Mobi, and will be available through Smashwords, Amazon, Apple, Barnes & Noble, Kobo, Oyster, Scribd, and others. You can read a chapter for free here. 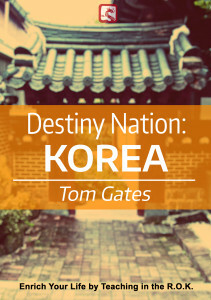 Read “Destiny Nation: Korea” now.